Leonard N. “Bud” Purdy died April 14, 2014, of natural causes at his home on Silver Creek west of Picabo. He was born in Beatrice, Neb., on Jan. 2, 1918, to parents Leonard Purdy and Rachael Kilpatrick. He was one of four children. His brothers, Bill and Paul, are deceased and his sister, Margaret Struthers, is alive at 93 and living in Twin Falls, Idaho. Bud’s grandfather, W.H. Kilpatrick, and his wife, Maggie, and Bud’s mother, Rachel, raised the three boys and Margaret after Rachel was divorced from Bud’s father in 1923. Bud’s grandfather’s construction company built 5,000 miles of railroad across the United States and had many other investments. In 1882, they surveyed the Oregon Short Line spur to Hailey and took up three sections of land, which became the Kilpatrick Bros. Ranch. Bud’s grandfather, W.H., began sending the boys in the summers to work on the Picabo Kilpatrick Bros. Ranch when Bud was 10, where they learned to work hard. Bud’s grandparents and mother lived in Redlands, Calif., where the boys went to military school and Margaret went to boarding school. At 16, Bud attended college at Washington State in Pullman, Wash., and graduated in business administration in 1938. The local bank offered him $50 a month, but his grandfather offered him $60 to go to Picabo and take over management of the ranch. A year later, Bud married Maxine Dahl, who became the mother of Bud’s three children, Nick, Mark and Kris. Bud divorced Maxine in 1950 and married Ruth Eccles in 1952, and she and her son Gordon Eccles moved to Picabo. Ruth became the bookkeeper and postmaster for the Picabo Store, which Gordon later ran as manager after he graduated from college. In 1955, Bud and Ruth bought the ranch and other assets from Bud’s family, the Kilpatricks, when they liquidated all their assets across the country because they had no heirs to take over. Bud’s sister, Margaret, and brother Paul took over the sheep and Bud and Bill and Ruth took the cattle and the ranch in Picabo. Later, Bud and Ruth bought Bill out of the ranch and they bought the Picabo Store and Picabo grain elevator and seed business, Silver Creek Supply. Bud and Ruth worked hard building up the ranch and running the different business they acquired, but hunting and skiing during Sun Valley’s early days was a diversion they enjoyed. They met a lot of interesting people who visited the area and became lifelong friends to many of them. Bud took up flying in the ’40s and it became an important part of his life and very helpful on the ranch for business and for going to the many meetings he attended across the state. Bud was exempted from World War II because of his management job on the ranch and the need to produce food and fiber for the nation. Help was very hard to find during the war and many mornings workers were employed from the hobo camp by the stockyards on the railroad in Picabo. Bud was very generous with his time and money. He served on countless boards and committees and never accepted any compensation. He was very honest and had a reputation of being very fair. He treated his employees well and paid top wages, and many of them worked for him all their working life. He loved the cattle business and loved running cattle on the open range and the gathering of them and the herding of them to new pastures. Bud has always been a leader and joiner of organizations. 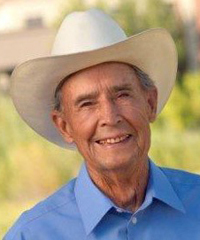 He was instrumental in the establishment of the Cattle Association that supported Idaho’s cattle industry and served for two years as its president and many years on its board of directors. He served as chairman of the Idaho Rangeland Committee from 1970 to 1987 and also on the National BLM Advisory Council and the Idaho Rangeland Commission for 10 years. Education was very important to him and he was president of the University of Idaho Foundation for two years and president of the College of Southern Idaho Foundation. He was chairman of the Blaine County Medical Center from 1964 to 1982 and instrumental in helping raise funds for the new St. Luke’s hospital. He was chairman of the Idaho Association of Commerce and Industry when it was founded and which has become one of the biggest lobby groups for businesses in Idaho. Bud has received many awards through the years, so many that the walls in his office won’t hold any more plaques. He was honored as a Distinguished Citizen by the Idaho Statesman. He was awarded an honorary doctorate degree in range science from the University of Idaho and he received many other awards from the University of Idaho and the College of Southern Idaho. He was inducted into the Idaho Hall of Fame in 2013 and he was grand marshal of the 2013 Ketchum Wagon Days parade. He has been featured in many newspaper and magazine articles and on many TV documentaries. Bud is survived by his sister, Margaret Struthers; his three sons, Nick, Mark and Gordon and his daughter, Kris Wenslaswki; 12 grandchildren; and 20 great-grandchildren. He was preceded in death by two wives and one grandson. Burial for Bud will be in a private cemetery with only family and employees on his ranch attending. It will be under the arrangements of Wood River Chapel. There will be a celebration of his life on May 4 at 3 p.m. in the Limelight Room in the Sun Valley Inn at Sun Valley for his friends. In lieu of flowers, please contribute to the St. Luke’s, University of Idaho or the College of Idaho foundations. Friends are invited to leave a message of condolence, share a story or photo, or light a candle at www.woodriverchapel.com.